The exhibition builds on Easton's previous explorations of urban landscapes, and transforms the gallery into a mysterious, immersive space. By layering hundreds of individually printed, hand-coloured etchings within an architectural structure, Easton creates a darkened portal through which viewers travel to encounter a complex, nocturnal streetscape. Stepping into the pitched roof, house-like structure that dominates the gallery, the viewer enters an inverted world where the ordinary takes on a heightened, uncanny quality. Once inside this seemingly familiar domestic space, our perspective is dominated by an illuminated image of a night-lit box junction on Dog Kennel Hill, South London, which fills the gallery wall ahead. In this altar-like tableau, expressionistic marks and decorative detailing combine with the complex, hard-edged geometry of the layered paper, suggesting an obsessive process of dissection and reconstruction. This fragmenting and re-assembling of the image pulls the viewer in and out of the surfaces, absorbing them into its layered history. In the piece, Easton evokes the memorable, haunting atmospheres of her etchings and paintings, but here we are enveloped by the visual space, held within the box junction as the spectacle of the nocturnal city rises ahead of, and around, us. Gently arching trees mingle with car lights in ritualistic procession. Organic forms emerge. Demonic faces leer momentarily, only to disappear again. This is a place where elements conflict and collide, only to split, engendering further mirroring, pattern and illusion. Grimy and shimmering, alluring and threatening, the work conjures the city at nightfall, the point at which certainties dissolve and an unremarkable London street begins to resonate with strange new visual and narrative possibilities. 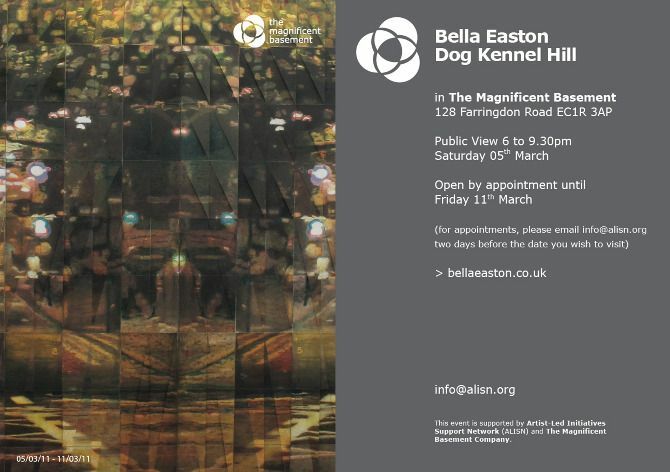 Bella Easton studied at The Royal Academy and lives and works in London. Before the forthcoming installation at The Magnificent Basement, her work was most recently shown at The Invisible Dog, Brooklyn, NYC (2010). Easton has been included in numerous solo and group exhibitions including; âCrash' at Charlie Dutton Gallery in London-selected by Matthew Collings and Dan Hays; the Royal Academy Summer Exhibition; The Threadneedle Prize; SV02 at Studio Voltaire in London; the British Council in New Delhi, India; and Rundgang on Hardenbergstraà Š¸e in Berlin. She was recently made a Painting Finalist in The Celeste Prize 2010.